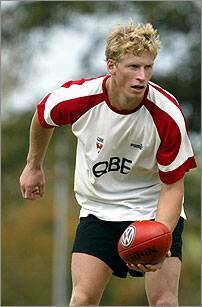 Craig is a professional AFL footballer who plays for the Sydney Swans. 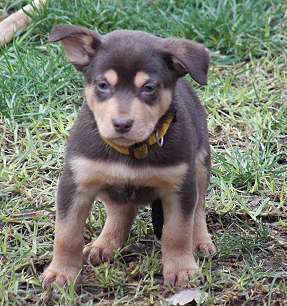 He wanted a good mate to run with and share his life and we spent quite a bit of time and looked at four different litters for Craig before we finally picked Utah. Mary and Stephen, Just thought I'd let you know how Noonbarra Utah is settling in. He's been absolutely terrific so far, and really enjoying himself! He seems to have adapted to city life well, I take him out for a run and down to the park at least once a day. He absolutely loves playing with other dogs down at the park and also humans as well. He has a great temperament and is really good with kids. He's been fine at night sleeping outside, and his toilet training has improved out of sight. I've been concentrating on the sit, down and stay commands and he's been really responsive. Jez, what a sweetheart! Another very pretty and friendly puppy by Max and Jessie. 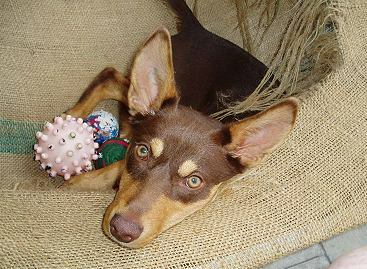 Sharon is an Agility instructor and her dog will be trained for Agility competition. Sharon wanted two things; A pup who had some drive and a pup who was cute. 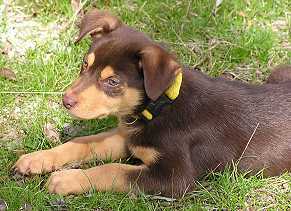 She got both in spades as well as a great temperament, very intelligent, agile, faithful and biddable. 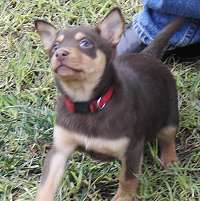 Another thing Sharon requested was that the puppy was a red & tan. 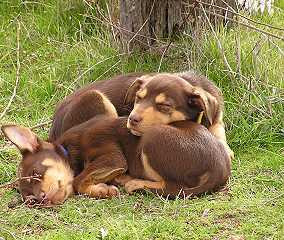 Sharon just had her older Kelpie die of Cancer and as he was a black & tan, she didn't want to be reminded of him every time she was with Jez. "She is a quick learner and catches on to things very quickly. I am using her as a demo dog in our beginners class. Many people have commented on her colour, looks, social skills and learning ability. " ... "This weekend Jez and I are off to a 2 day workshop on foundation training with a handler from Canada who competes in agility at world level. She has been brought out by our agility association." 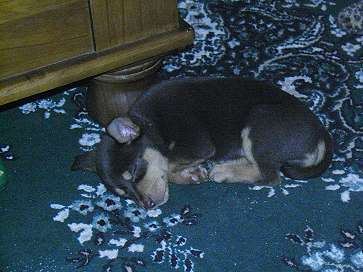 " As you can see from the photos, when she is not causing havoc, she is sleeping! You can see her ears started to stand up before she was 3 months old. I didn't think this was a big thing. But a couple of people commented on it and I found it amusing that they thought it was a 'milestone'! It doesn't worry me. I am still waiting for her to grow into those ears!!! Sharon Mellema & Noonbarra Jez. 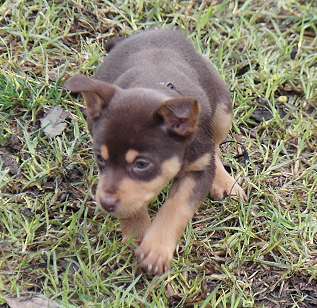 "This weekend we are off to Uralla for a herding trial. On the Saturday afternoon, they are putting on a small clinic with John Rosten which is a bonus for us. Since our last talk Jez has come along in leaps and bounds. 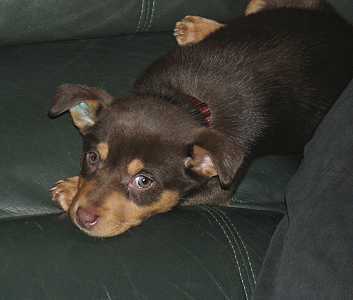 Like you said, I chilled out a bit and allowed her to be a puppy and I think a combination of this and her maturing 'things' seem to be coming together. Last weekend we were working with approximately 20 sheep. She was again in her element! 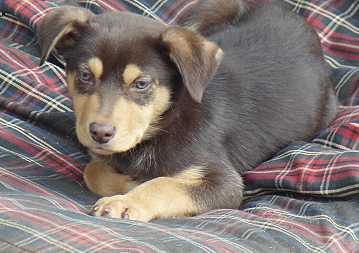 Another Noonbarra puppy has commenced agility at our club. Noonbarra Banjo! 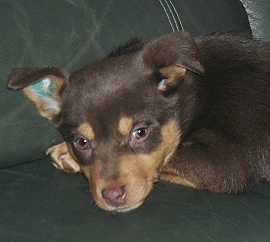 I think Banjo was in the other litter Max/Amy at the same time as Jez. Two days apart. " We did our very first trial up here in Queensland on Saturday (Herding Started A course) and we qualified with a score of 92 and a high in trial award. I was pretty pleased about that. However, on Sunday it went a bit pear shaped, but you get that when you're learning don't you! We are still doing agility although we haven't competed yet. We're just taking our time. Jez just has to learn that a white bichon frise is not a small sheep! We have two in our agility club and as soon as she sees them, she is rounding them up including a giant white poodle! She doesn't do this to any other dog. Later this year we will be moving to a bigger property. We have bought 5 acres not far out of Brisbane. Soon we will commence building a new house. Also the plan is to get our own couple of 'dog accessories' (sheep) to practice on. I'm looking forwarded to that. 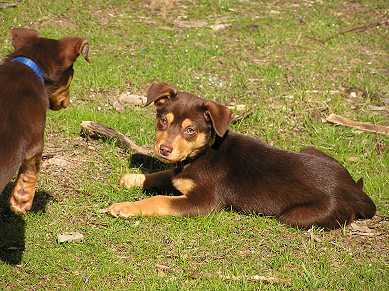 I'm off to see the Australian Yard Dog Trial Championships at Goondiwindi in May. I haven't seen a yard trial before, so I'm looking forward to that too. I don't plan on Jez doing this. She is a bit soft and I think this might be a bit confrontational for her at the moment. She is building her confidence up. We had a chance to work in the stock yard the other week and towards the end she was getting a bit cocky! All she was doing was moving sheep in and out of pens in a small area. I'll see what happens when she gets her own sheep! Isn't it funny, I wanted a dog to do agility and I am doing more with herding! Hi Mary, I read with interest your comment about Jez being great in yard dog work. I wasn't planning to pursue the yard work because I thought that might be a bit too intimidating for her as her forte is working distance and fetching. I will have to seek out someone to help me to bring out her potential in yard work. I don't know if you know Eric Tighe, but he has opened up his property in Queensland for herding lessons. I haven't met him yet nor have I had lessons from him. A lot of people who have had lessons from him are giving him a glowing report. His property is over 120km from me. He is competing in the National Yard Dog Champs this weekend, so I will get to see him run. Maybe he might be able to help me. Different trainers have different views on training methods. Example; Robert, Jenny and John recommend staying in a small yard to build skills but most others say get out of the small yard ASAP and learn the skills in a bigger paddock. I don't know what your views are, but I tend to agree with Robert & co, you have more control over the dog and sheep and you have a better chance of getting the right picture for your dog. In a large paddock, things tend to go pear shape pretty quick. From a learner's view, this can become a bit conflicting as both may have valid reasons, but who is right? Oh the battle of learning! Poor Jez! I always say to myself, what makes sense and go with that! Jez is doing well in herding and agility. Last weekend she got Reserve High In Trial in the Queensland Championships for Herding Started B Course Sheep. I was pretty pleased with that. She only missed out high in trial by 1/2 point. The American judge told me 3 times she wanted to take Jez home with her back to the United States. 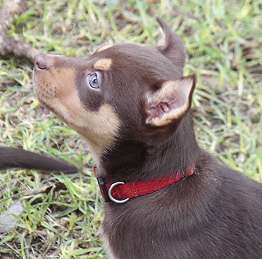 A couple of weekends before that, she competed in the Working Kelpie and Cattledog club trial and received High In Trial on Ducks! We have never trained on ducks. She has seen them and had a short play with them but that's the extent of her exposure. I have been helped by Robert Cox and a little more regularly now by Eric Tighe. The best thing that helped Jez's herding ability was Eric allowing us to go and work a small mob on a number of occasions. That has brought the best out in mine and Jez's understanding on working with sheep. She is more confident and will come and assist me now in working up close. Must go, I hope Stephen's health continues to improve. P.S. 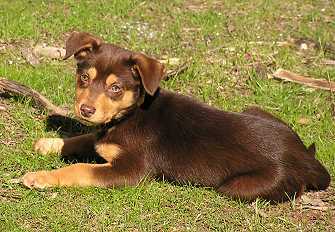 I am thinking about another Noonbarra Kelpie in the next couple of years!! 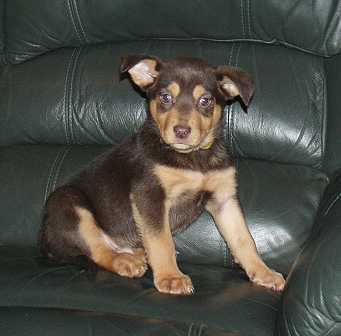 Misty was a lovely puppy. 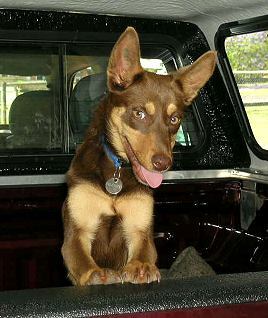 Simon had his Kelpie accidentally run over and wanted a puppy who was good natured and intelligent like the Kelpie he lost. Misty had a terrific personality and a good sense of fun. A very happy, pretty little girl! I am sending you a photo of Misty Jones (Amy) at 10 months old she is growing up to be fine little girl and I can't believe how much her personality is like my other dog, Ruby, that I lost last year. Thank you for picking Amy for me. 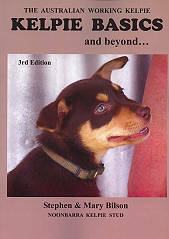 This book is designed for good solid foundation training to ensure you get a well balanced, socialised and obedient Australian Working Kelpie.